Subject: Thank you for the pleasures of building and sailing your boats. Your smallest boat the Pee Wee has provided me and my two sons many hours of enjoyment. While my sons were quite young in 1984, I got your patterns and built ours. We call it "Little Zipper". 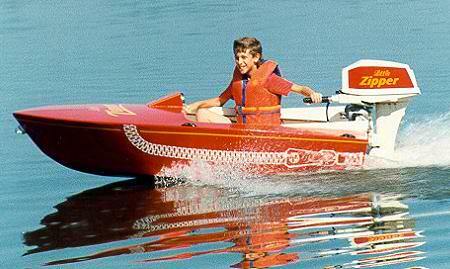 Pushed by a reconditioned 1962 9hp West Bend it skims along at 20mph. We have even taken several long distance trips through the Kawartha lakes with two aboard. Thank you many summers of fun in your Pee Wee runabout. PS: This is my third Glen-L boat, my first was a XP-8 in 1969!